The Wiking division was the only armoured SS division to fight exclusively on the Eastern Front. It is true that it was partly composed of Flemish, Dutch and Scandinavian volunteers whose primary motivation—for most of them—, was to fight against Bolshevism. It would have been a political mistake to go up against the Western Allies. 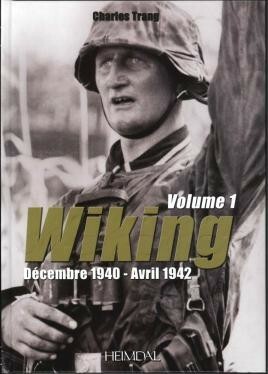 • An extremely detailed history of the Wiking division of the SS, accompanied by over 2,500 exceptional photos. The Wiking division was the only armoured SS division to fight exclusively on the Eastern Front. It is true that it was partly composed of Flemish, Dutch and Scandinavian volunteers whose primary motivation—for most of them—, was to fight against Bolshevism. It would have been a political mistake to go up against the Western Allies. The division fought with an unrelenting energy despite the fact that victory was not always equal to its efforts and sacrifices, as in Cherkasy or Hungary. Among the ranks of its officers were included men such as Felix Steiner, Herbert Otto Gille, August Dieckmann, Hans Dorr and Walter Schmidt to name a few. The history of this division, extremely detailed and illustrated by more than 2,500 exceptional photos largely from personal collections is here traced through a series of three volumes. The first covers the period from December 1940 to April 1942, the second from May 1942 until April 1943 and the third, recounts the last two years of war. Felix Steiner was a German officer, who became Obergruppenführer of the Schutzstaffel, General of the Waffen-SS, and a signed-up member of the Nazi Party of Nazi Germany. He served in both World War I and World War II and was awarded the Knight's Cross of the Iron Cross with Oak Leaves and Swords. Herbert Otto Gille was a German general, and as a winner of the Knight's Cross with Oakleaves, Swords and Diamonds and of the German Cross in Gold, the most highly decorated member of the Waffen SS during World War II. By the end of the war he held the rank of SS-Obergruppenfuhrer und General der Waffen-SS. Hans Dorr was a German Waffen-SS Obersturmbannführer (Lieutenant Colonel) who served with the 5. SS-Panzer-Division Wiking and was a commander of the SS-Regiment Germania. He was wounded 16 times during World War II and died at a Field hospital near Judenburg only a month before the war's end. He was also awarded the prestigious Ritterkreuz des Eisernen Kreuzes mit Eichenlaub und Schwertern, Knight's Cross with Oak Leaves and Swords. The large number of photos provide excellent references for modellers … Trang has clearly devoted an amazing dedication to establish this level of detail on the Wiking division and I think we as interested historians are very fortunate to be able to share in the results of his dedication. The photography is out of this world. … This book is essential for living historians and re-enactors because there are so many tableaux to recreate and perfect here I came away recalling snaps of the groups I have photographed on the circuit down the years.